The History of Inobong and Penampang Mission from its foundation until the end of the Second World War (WW2), 1887 – 1945. In April 1883, Fr. Alexander Prenger arrived in Labuan and was appointed by Mgr. Thomas Jackson as assistant to Fr. Pundleider in Simpudu, Papar. In June 1883, Fr. Prenger left Simpudu and was appointed to Sandakan to open a Mission there. In 1883, Fr. Prenger was with Fr. Pundleider in Sandakan but found there was too little work for two priests serving in Sandakan. So Fr. Pundleider who was an explorer in his own way decided to go to Bundu in his own boat. By February 1884, Bundu Mission was open. Toward the end of 1885, Mgr. Jackson asked Fr. Prenger to leave Sandakan and appointed him to be assistant to Fr. Pundleider in Bundu, Kuala Penyu. In June 1885, Fr. Prenger and Fr. Ignazio rowed up the Putatan river, he came to a village on the bank. That was the first time priests visited Putatan, a Kadazan village. Fr. Prenger had been in SImpudu and so he could have said a few words in Kadazan which made him welcome by the people. This first visit was of short duration. This was more an introductory visit. Perhaps there was not enough work for two priests in Bundu, so in June 1886, Fr. Prenger visited again the people in Putatan village and went up river as far as Inobong. This was a first visit of a priest in Inobong, another Kadazan village on the river bank. He met and talk to some people there. He settled down in Inobong to open a Mission Station. At the beginning of 1887, Fr. Prenger opened Inobong Mission and started teaching the people about the Christian religion. He had a few people who were interested. By Easter 10th April 1887, he baptized four boys in Inobong; Petrus Moliping, Paulus Satabar, Michael Mohujang and John Tan Kan San. On 29th May 1887, he baptized Aloysius Fo Tan and on Christmas day the 25th December 1887, he baptized 14 more; Thomas Bersalik, Anna Sabahan, Agatha Damail, Joannes Tan Kan San, Marcus Labanta, Lucas Damahar, Francis Menjahom, Theodore Malajam, Andreas Sungkipeng, Gabriel Matajak, Augustine Mensala, Maria Dusioy, Cecilia Dingihon and Ludwig Masankim. Fr. Prenger did not stay in one place only. He really worked hard to teach the Christian religion to them. With Inobong as the headquater, he traveled far and wide to preach the Good News to the people. In August 1887, he walked as far inland as Tambunan area but the people in Tambunan did not welcome him. The first Sacred Heart Church, Inobong was completed and opened. In 1889, Fr. Prenger went downriver to visit the people in Penampang. By this time, he was fluent in Kadazan. Fr. Prenger built a house there and soon Penampang became the outstation of Inobong Mission. Fr. Rientjes was sent to assist Fr. Byron in Sandakan Mission in November 1889. Almost immediately Fr. Prenger visited Fr. 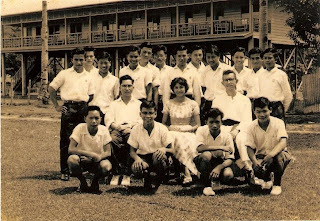 Rientjes in Sandakan for they had been classmates in the Seminary, and asked Fr. Rientjes to join him at Putatan in ‘a new Mission in Penampang’ where a house had just been built. At the beginning of 1890, Fr. Rientjes arrived in Penampang and was put in charge of Penampang Mission. Around the same year, the building of the first Penampang church began. In July 1890, Fr. Prenger was called back to teach at Mill Hill College. Fr. Rientjes was left alone. He stayed at Penampang to work among the people in Penampang and visited Inobong on every other Sunday. Fr. 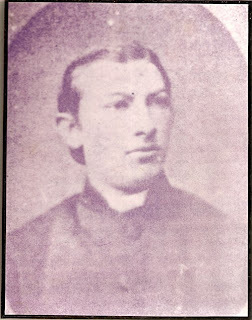 Rientjes drowned in Putaton River on Ascension Thursday the 15th May 1891 when Fr. Prenger was teaching at Mill Hill. Since no Catholic priest could be present at his funeral, he was buried with the Anglican prayers said over him (He was buried at the Inobong Catholic Cemetery). After the death of Fr. Rientjes, Fr. Reyfert and Fr. Pundleider came to help in Inobong and Penampang for a while. Fr. Prenger came back to Borneo after four years, on Tuesday the 3rd June which marked, as Mgr. Jackson remarked, the ‘Principal Date’ for the year 1892. “It is said that Fr. Prenger asked every day at Mill Hill to be sent back.” (Staal). He went straight back to Inobong. Mgr. Jackson appointed Fr. Duxneuner to assist Fr. Prenger at Inobong in February 1893. With two priests at Inobong, Penampang began to progress. By the middle of 1893, Penampang Mission could stand on her own. In September 1893, Fr. Duxneuner settled in Penampang to manage the Mission work there. He was conferred the title “FOUNDER” of Penampang Mission because of his hard labour and determinations to establish the Mission. In September 1893, he was assisted by the local faithful in putting up the cross on top of the MOUNT TIVUNG. On Ascension Day, 8th May 1897, the Inobong Church was blessed. After the year 1900, concentration in Mission work shifted from Inobong to Penampang. The situation in inobong Mission was not encouraging. Of the 120 Catholics, only 9 people attended Mass regularly. On the 5th March 1902, Fr. A. Prenger died while seated and resting. The faithful mourned his death and kept vigil over his body for three days until Fr. Gossens and Fr. Williams came. His body was buried alongside that of Fr. Rientjes at the Inobong Catholic Cemetery. Inobong was finally made the outstation of Penampang. Fr. Van den Besselaar started a school at Inobong, but only a handful of boys attended class. On the 24th February 1906, Fr. 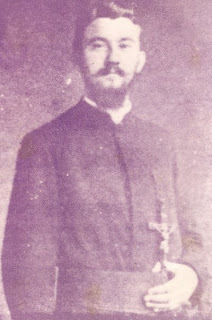 August Wachter became assistant to Fr. Duxneuner in Penampang Mission. Fr. Wachter began a proper school in Penampang. Fr. Wachter was forced by circumstances to go back to Inobong. So in February 1910, Inobong Mission was again opened as a station. The first catholic school in Limbanak was built in 1910 by Fr. Wachter. The building with only one classroom was constructed on stilt with attap roof and its wall was half covered with planks. Fr. Staal arrived at Inobong to help Fr. Wachter. Fr. Wachter built a big school for boys in Inobong. In the same year, the convent in Inobong started. With the presence of the White Sisters, Mission work expanded in Inobong reaching both men and women. The sisters stationed in Inobong were Mother Stanislaus, Sr. Innocentia and Sr. Alban. The year 1917 saw the return of Fr. Wachter to Penampang Mission because Fr. Duxneuner had to go back home. Inobong Mission again became an outstation of Penampang Mission. From the year 1917, organization of Mission work in Penampang area was centred in Penampang Mission. In the middle of 1920, Fr. Joseph Staal came from Sandakan to assist Fr. Wachter in Penampang. As an assistant Fr. Staal looked after the interests of Inobong Mission. During this period, the outstations of Penampang – Inobong Mission, went as far as Tambunan. Fr. Staal went with Mr. Louis Majapur, a catechist, to Tambunan. Fr. Staal was a keen explorer. They traveled on foot up and down the Tambunan plain. There, they built a small house made of bamboo. 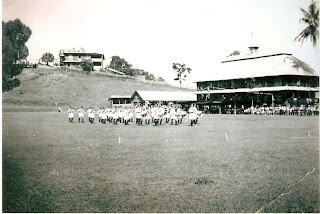 In September 1921, the Inobong Convent and School were moved to Penampang. Fr. Staal wanted to concentrate his work in Inobong. In early 1922, Fr. Staal moved to Inobong to be Rector there. Once again Inobong became a head-station. In the meantime, the number of Catholics increased in Penampang. The small church could no longer hold the growing number of Catholics. In February 1922, the Penampang Church was extended by 33 feet. The number of children attending Sunday school also increased. There were four schools in Penampang and the Mission works in Penampang speeded up and the number of Catholics also increased as more and more outstations were being opened. The first Catholic Church Building in Limbanak was built on a piece of land at Kampung Limbanak, bought by Fr. Wachter. A new period of Penampang Mission began after Fr. A. Wachter was appointed the Prefect Apostolic of North Borneo and Labuan on 26th July 1927. Mgr. Wachter made Penampang Mission his headquater. Hence, Penampang Mission became the centre of Missionary activities in North Borneo and Labuan. Mgr. Wachter continued the policy to expand Mission work. Penampang Mission became one of the centres of expansion. Penampang Mission took charge of the outstations at Putatan, Inobong, Limbanak and Inanam Mission. In Penampang Mission itself, one of the permanent signs of expansion was the building of the Stone Church. This work began in the early 1930s. As early as April 1929, Mgr. Wachter already had the intention of building this church. He was offered US$1,000.00 for a chapel in Kudat, but he was almost tempted to keep back the money for the Penampang Church. The site for the Penampang Church was ready by the middle of March 1935. 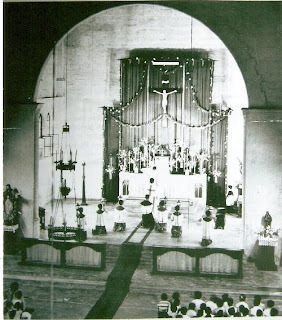 On April 1935, the two church bells which were hung on a temporary tower were solemnly consecrated by Mgr. Wachter. The foundation stone for the new church was laid during a special ceremony on the 29th September 1936, the Feast of St. Michael. And for the building of the church, Mgr. Wachter had specially invited Brother Aegidius Leiter, the master builder, to be responsible. Later, Brother Alexander, Brother Pius and a number of local people came to help in the work. The church took a long time to build because of the amount of work involved in the cutting of the stones and carrying them to the site. When the Second World War began, only the walls were completed. The condition of the church without a roof saved it from being bombed during the war. Work on the building began again after the war. It was completed in 1947. Besides concentration on the progress of the building of the church, Mgr. Wachter was also following closely the progress of the Mission work in the Penampang area and in the other Mission stations. A party of Japanese soldiers came to tell the priests at St. Michael’s Mission, Penampang that they wanted to occupy all the Mission buildings. Mgr. August Wachter, who was then the head of the church, told the Japanese soldiers that this was not possible.he sent Fr. Joseph Theurl and Brother Aegidius Leiter to Jesselton to speak to the Japanese Commander, but his effort proved to be no avail. At that time, the Carmelite Sisters were staying at St. Michael’s School, after they were forced to leave their monastery at Jesselton. The Sisters were the first to hear the news and were greatly upset. The news of the Fathers going to be sent away spread like wild fire through the kampongs and people started crowding up the hill where St. Michael’s Church was located, to see the priests who heard confessions from morning till 11 o’clock that night. The Carmelite Sisters spent the night before the Blessed Sacrament and praying that our Lord might avert the threatening calamity and allow the priests and brother to stay. On the morning of May 19, 1945, Fr. John Unterberger said Mass for the Carmelite Sisters at their chapel in what used to be St. Michael’s school. Mgr. Wachter, at the same time, said his last Mass at the Penampang Church which was crowded to capacity. The atmosphere was tense because everyone was aware of the dangers ahead. The Japanese officials arrived at about 4.00pm that day, greeted by Mgr. Wachter who was accompanied by the Fathers, Carmelite Sisters, and a number of parishioners. They met the Japanese officials in front of the Carmelite Convent. Their spokeman was a certain Yamada, an Oxford graduate and former resident of Jesselton. The Carmelite Sisters appealed to them not to send the priests away, saying they needed spiritual help which only the priests could provide. The whole group adjourned to Mgr. Wachter’s house for a meeting. Five Japanese, including Yamada, told the church delegation that they had considered the matter and had decided to move the priests to Tenom. Yamada said the Penampang hill was going to be a battlefield and since they were responsible for the lives of the priests, it was their duty to protect them. Mgr. Wachter, in reply, implored to allow at least one of the priests to stay behind in order to look after the Christians and the Mission property. The Prefect Apostolic said he would not mind to take the risk to stay behind himself by facing the enemy, as his life belongs to the people. The Japanese however, were adamant and said it could not be done. Mgr. Wachter insisted on staying and repeated his petition five times. But his pleading felt on deaf ears and they were told to be ready at 10.00pm that evening. At the appointed time, two cars arrived with a Japanese party and Yamada. The priests and Br. Aegidius Leiter traveled in the cars with the Japanese, whilst three boarders, Patrick Lee, Peter Wong and Stanislaus Sabahai, and the luggage were put on a lorry. Mgr. Wachter together with seven other Mill Hill Priests, one Mill Hill brother and three mission boys were forced to march along the railway line, barefooted in the heat of the day to Sapong Estate, Tenom (about 100 miles away). Mgr. Wachter was physically weak as he was already 67. Fr. Anthony Paulmich died in Tenom before Allied armies arrived and the others were taken to Sapong. Never did we hear what happened to them. Later on, after the War, the Japanese said that the priests were killed in an Allied air raid in June. However, the priests were seen alive in early August. Never have we found a trace of them. Except the remains of Fr. Paulmich which were brought to Penampang in 1959. The other priests taken with Mgr. Wachter, Fr. Paulmich and Br. Aegidius, were; Fr. John Unterberger, Fr. Anthony Reich, Fr. Joseph Bohm, Fr. Mark Oberteggerm, Fr. Joseph Theurl and Fr. Francis Flur and three faithful boarders Patrick Lee, Peter Wong and Stanislaus Sabahai who followed them. 18th January 1946 : Fr. James Buis was appointed the Prefect Apostolic of the Borneo Mission. When World War II ended, Fr. Antonessen was released from prison and re-open school. Rev. Fr. Antonessen was appointed as Rector of Penampang Mission till the year 1962. The school in Penampang and the stone church was re-open. Fr. Antonessen vigorously raised fund of about RM40,000.00 from the people of Sabah and oversea to complete the stone church. The stone church of St. Michael finally had roof to complete the building and saw its second Mass on Easter Sunday of 1949. Fr. McLindon instigated the ‘Legion of Mary’ which help to spread the Good News and taught the people about Catholic believes. [Penampang] The Praesidium Legion of Mary, Penampang was established on the 8th September 1950. The Praesidium of Penampang was named ‘Our Lady help of Christian’. [Limbanak] The Praesidium Legion Mary in Limbanak was born with the name ‘The Queen of the Apostle’. Prefecture Vicariate; Mgr. James Buis was appointed the first Vicar Apostolic (1952 – 1975) and stayed to shepherd the faithful in Penampang. [Inobong] The Legion of Mary in Inobong was established, bearing the name ‘Queen of Virgins’. Secondary two was the highest education offered in Penampang School. [Kinarut] Kinarut’s Legion of Mary was established with the encouragement of Fr. Cowan, named ‘Queen of Mission’. Fr. Henselmans established the Junior Secondary in Penampang. [Limbanak] The first church in Limbanak was demolished to make way for the erection of a new church. Fr. Jud played a crucial role in the raising of fund to build the new church. Fr. Jud preached the Good News all over Penampang. Rev. Fr. Joseph Dapoz was appointed Rector of Penampang (1962 – 1965). [Limbanak] The second church of Limbanak was completed and opened in 1962. 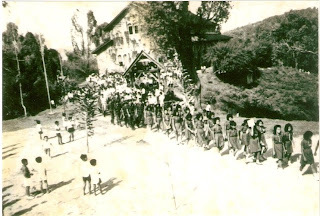 [Tombovo] A school in Kg. Kapazan/Tombovo was erected and blessed by Fr. Jud. The school was also used by the priests to hold Mass whenever they visited the kampong. Sabah joined the federation of Malaysia in September 1963. Fr. Augustine Amandus from Papar was ordained to the Priesthood and became the first kadazan priest. Rev. Fr. W. Smith, who was the Rector of Penampang, established the first Parish Council in Sabah. Those who were present during the momentous meeting to discuss the possibility of establishing a Parish Council were Frederick Jinu, Charles Labunda, Peter Lidadun, C.J. Thomas, Stanislaus Tendahal and a few others. Fr. W. Smith took leave and was replaced by Fr. 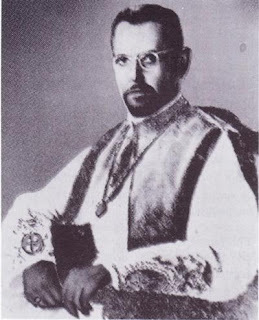 Terpstra (1968 – 1969) as Rector, until replaced by Fr. Jud. [Duvanson] The first Chapel in Duvanson was built in 1968 and was used till the year 1976. During Fr. Jud time as Rector, he established the Penampang Parish Council (PPC) and several outstation churches followed suit. Therefore, the Penampang Central Parish Council (PCPC) Committee was formed to manage all the Parish Councils under Penampang Parish. Senior Secondary education began in the Penampang School and the new St. Michael school building was erected, costing RM200,000.00. 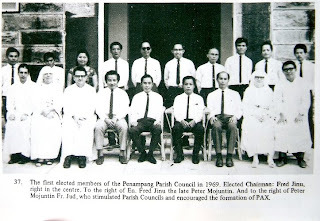 Inobong, Limbanak, Kinarut and Duvanson/Putatan (21st March 1970) established their own Parish Council. Several white priests and sisters were captured and ordered to return to their country of origin. Tombovo/Lokawi Parish Council was established on 20th September 1970. Boys and girls student attended school together; St. Joseph School as a primary school and St. Michael School as a secondary school. Mgr. James Buis instigated PAX. [Women’s League] The Parish’s women’s league was established, with Mdm Rosenani Songondu holding the temporary chairlady post. Outstation parishers also established their own Women’s League committee. Babagon Parish Council (BPC) and Babagon Parish Youth Council (BPYC) was created. BPC’s first chairman was Mr. Joe Tangkit. More Kampong Catholic Committee were established. Tombovo first chapel, St. Peter Tombovo, was erected. [Kolopis] Mr. Augustine Tairin and several others seek permission from Rev. Fr. Preyde, the Rector of Penampang Parish, to erect a small church at Kg. Tindai, on a piece of land owned by Mr. Touggiluk Mulumpang. Permission was given and a 20 x 40 feet church was built. A second Cross was built to replace the decaying first cross at ‘Nuhu Tivung’. Legion of Mary in Sugud was formed on 26th November 1975, resulting from the encouragement of Br. Peter Mogunjil who was a member of the Legion of Mary in Limbanak. The new legion was named ‘The Queen of Peace, Sugud’. Kota Kinabalu Vicariate was elevated to Diocese of Kota Kinabalu, whereby Bishop Simon Fung was appointed as KK diocese’s first bishop. The first PPC chairman, Datuk Peter Mojuntin, perished on 6th June 1976, when the airplane he and Sabah Chief Minister Tun Fuad Stephen, and some other ministers, boarded unfortunately crashed. Datuk Frederick Jinu was elected the second PCPC Chairman, and he held the post till the year 1991. St. Simon Duvanson’s second chapel was built. Inobong Women’s League was formed on 8th August 1977, under the management of first chairlady Mdm Nora Gombui. Terawi Parish Council was formed on 17th September 1977. Babagon’s first chapel, The Holy Cross Babagon, was erected and blessed by Rev. Fr. Alexander E. Sipanul. Rev. Fr. Thomas Makajil and Rev. Fr. William Poilis were ordained and were the first priests from Penampang Parish on the 11th November 1978. Fr. Thomas originated from Inobong, while Fr. William from Nosoob. Terawi’s first church, Holy Nativity Terawi, was erected and blessed by Bishop Simon Fung on the 22nd April 1979. [Kolopis] The second chapel, St. Simon Tindai, was erected and blessed by Fr. Alexander E. Sipanul, the Rector of Penampang. Mgr. Primus Jouil was ordained priest on the 1st May 1980, and so became only the second priest from Penampang Parish. Mgr. Primus is from Kg. Guunsing, Penampang.